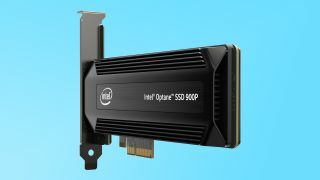 Intel has introduced a new Optane SSD 900P line of blisteringly fast solid-state storage drives. Not to be confused with Intel Optane memory, these are bonified SSD drives with sequential read speed rating of 2,500MB/s and a sequential write speed of 2,000MB/s. While that's not nearly as fast as the 3,500MB/s read and 2,100MB/s write speeds seen on top consumer SSDs like the Samsung 960 Pro-series, the Intel Optane SSD 900P-series is designed for extremely demanding workstation workloads. These would include 3D rendering, complex simulations and fast game load times. Intel claims its latest product was able to cut down the rendering time of a 7-second clip filled with 1.1 billion particles down from 17.4 hours to 6.3 hours. To achieve this level of performance, Intel explained it used 3D XPoint memory rather than traditional NAND memory seen in most SSDs. However, since the Intel Optane SSD 900P line is focused on reliability, they don’t offer much in terms of capacity. Initially, Intel is only offering its latest solid-state drives in 280GB and 480GB capacities. These Intel Optane SSD 900P drives also come at eye-watering prices, with the PCIe x4 Gen 3 versions costing $389 (about £300, AU$510) for an 280GB drive and $699 (about £530, AU$910) for the 480GB version. There’s also a 2.5-inch 280GB U.2 drive priced at $389 (about £300, AU$510). Although this SSD is aimed at the commercial and enterprise market, consumers can buy into these blisteringly fast SSDs. It’s no coincidence that Intel demoded the Optane SSD 900P-series with the game Star Citizen when it was announced at CitizenCon in Frankfurt, Germany. Intel Optane SSD 900P drives will be available starting on October 27. Will these drives race to the top of our best SSD charts?